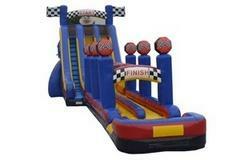 This is more than a jumper, its a bouncer, climb and slide with a goal thrown in for more fun. you can also make it your own theme from our selection of art pannels. Sorry guys this combo is for girls only. You can make it any theme you would like. 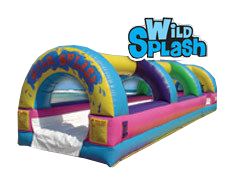 come climb, bounce,shoot and slide your way to a good time. The Big Kahuna is the all time favorite waterslide. With it's crazy 2 hump slide and pool at the bottom. Everyone loves this one. Are you the Big Kahuna??? Kahuna Water combo can be used wet or dry. Wet/Dry combo that gives you the best of both worls. 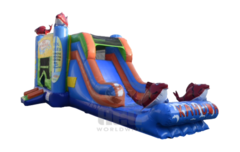 Bouncing and slide can be used both wet and dry. If your having a big water slide for the smaller ones, this waterslide is the one for you. 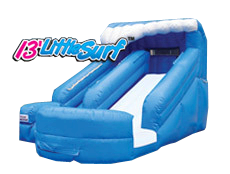 At 12ft in height and a great splash pool at the bottom, everyone is sure to get wet. This is an all time favorite... With two lanes to race each other, no one is left standing in line. 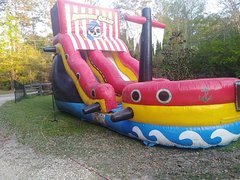 a full 30 ft in length your sure to stay wet!!! 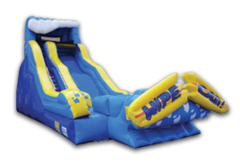 This is the largest water slide in our inventory, at 19ft in height, this one is sure to please everyone.